It is move out season in San Marcos! Leases are ending, keys are being returned, and tenants are waiting with excitement for their security deposits to return in the mail. 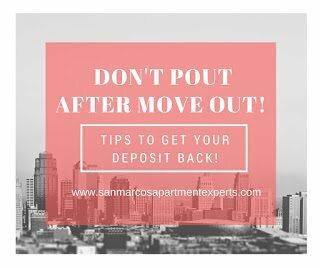 Although deposits are typically refundable, the amount returned depends on the condition of the apartment upon move out. We have some great tips to help you ensure you get the most money back! Leave Your Apartment Squeaky Clean! The best way to ensure the return of a deposit is to clean the apartment upon move out. We don’t mean a quick once over with a broom and a cleaning wipe. A deep thorough scrub is crucial to receiving that deposit back. Household items often overlooked during a cleaning spree include baseboards, kitchen appliances, ceiling fan blades, and window framing. This should only take a few hours, but it is the best surefire way to ensure a greater return in the end. Things Broken? Get It Fixed! Property management representatives have a massive task at hand during the first two weeks of August. They are expected to enter every vacant apartment and make the apartments ready for the new tenant. During this time they also assess the damages left behind by the previous tenant and assign charges to the tenant for each broken/damaged item, and those charges are typically taken out of your deposit. Less things to fix means more money in your pocket! Start submitting maintenance requests 3-6 weeks prior to your move out date so apartment staff can fix or replace items in your apartment that you would otherwise be charged for. Don’t Leave Your Apartment In Ruff Condition! In addition to a security deposit for the apartment, pet owners typically have to put forth a separate pet deposit. These deposits can range anywhere from $200-$800 and are at least partially refundable. 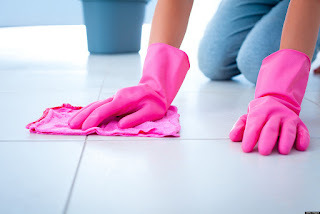 This helps to cover any damages made by the animals in the apartment, as well as cover the cost of cleaning the apartment once it has been vacated. Taking steps to ensure any pet damages are resolved prior to turning in keys will help ensure you receive more of your pet deposit back. Some ideas include renting a carpet shampooer, replacing any damaged blinds, and an extra pass over the ceiling fans with a duster to catch any remaining fur. Cleaning upon move out requires a little more time and effort, however if done correctly it will pay off later on. It is always nice to receive a check in the mail and be reimbursed for the money put forth several months prior. If you have questions regarding security deposits and pet fees feel free to give Apartment Experts a call at 512-262-9887. We are happy to help you make the most of your money!